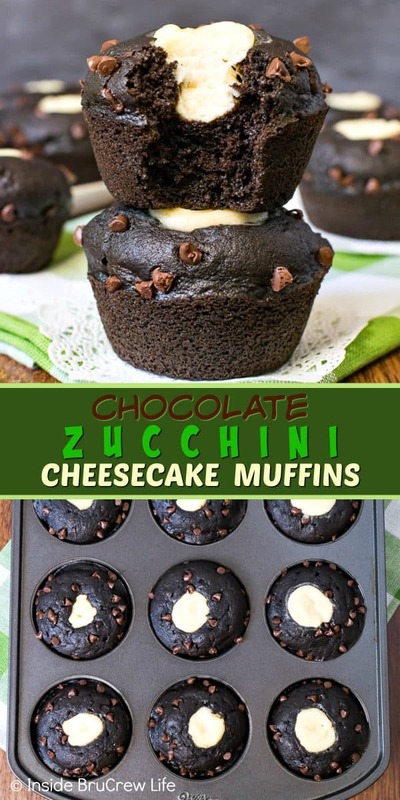 Chocolate Zucchini Cheesecake Muffins and a cup of milk is the perfect way to start out the day. Chocolate and cheesecake for breakfast always gets my vote. *Sign up for the free BruCrew Life email to get these recipes sent to your inbox. Well, our kids successfully managed their first day back at school yesterday. Is it me or does summer seem to get shorter each year? Maybe it’s just going by faster. Either way, it always shocks me when school rolls back around. I love having the kids home during the summer. Hello fun trips and house cleaners all the time. But I also love the routine of having them in school too. Our kids are going to a new school this year, and they have a little bit later start time this year. Not a huge difference, but enough that we had to switch our gym time to an earlier slot. I think I’m struggling with that more than the kids are struggling going back to school. Maybe a Dark Chocolate Latte every mid-morning to keep myself awake the rest of the day is a good idea! Even though the kids are in school and I already shoved a pumpkin recipe on you yesterday, I’m going back to my beloved zucchini. I hope you guys are just as crazy about this versatile veggie because I have a couple more dinners and treats to share with you. 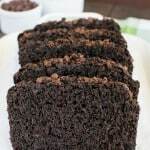 Of course, I couldn’t let the summer go by without chocolate coating some of the greens for you. 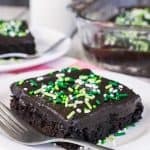 Every since I made (and devoured) this Dark Chocolate Zucchini Cake, I can’t get enough of zucchini in my chocolate goodies. It’s so yummy! But this time we are making a breakfast muffin with a cheesecake center. Any time we can make cheesecake AND chocolate and call it breakfast is a major win in my book. 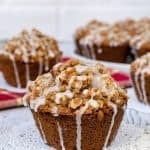 These Carrot Cheesecake Muffins from a while ago were my inspiration for today’s chocolate muffins. Changing out the shredded carrots for shredded zucchini and then adding some cocoa powder and chocolate chips just seemed like a good idea. 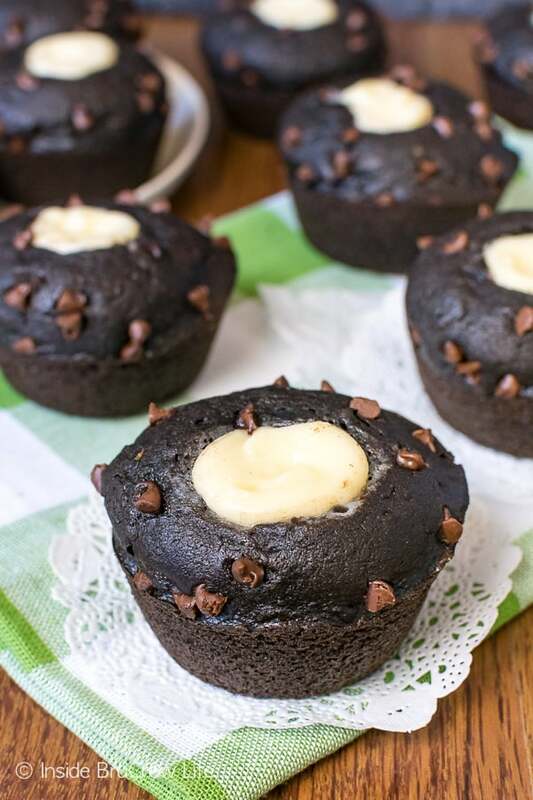 After waiting impatiently for the first batch to cool, I finally sunk my teeth into a few Chocolate Zucchini Cheesecake Muffins and am happy to report that this muffin makeover was a huge success. 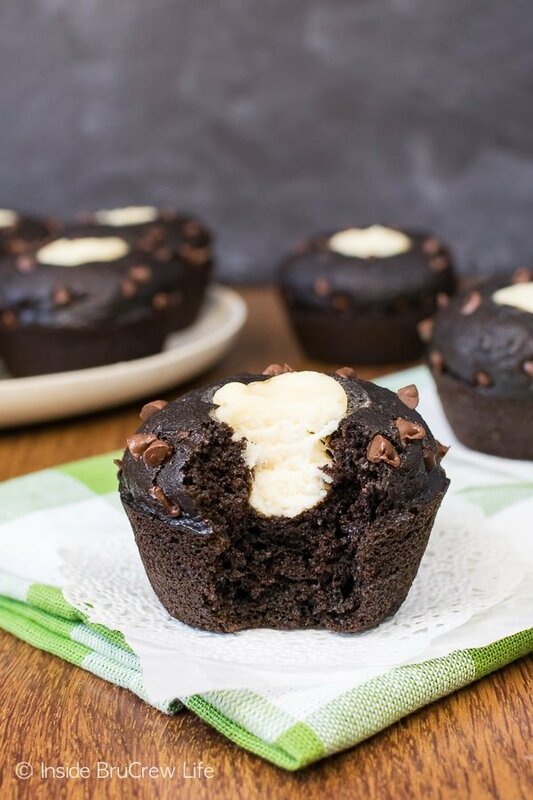 Soft fluffy chocolate muffins, melty chocolate chips, and a creamy cheesecake center will have you reaching for another muffin stat. 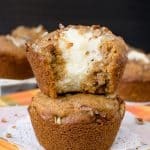 Trust me and run to the Farmer’s Market (or your garden) and pick up some more zucchinis because you need this muffin in your life like yesterday! Shred your zucchini using the fine side of a hand grater. 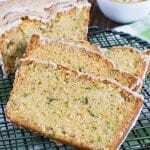 As long as your zucchini isn’t super juicy, there is no need to squeeze out the liquid. Mix together the oil, sugars, vanilla, and eggs in a large bowl. Stir together the dry ingredients and add that alternately with the buttermilk until everything is mixed together. Stir in the zucchini and some mini chocolate chips gently. 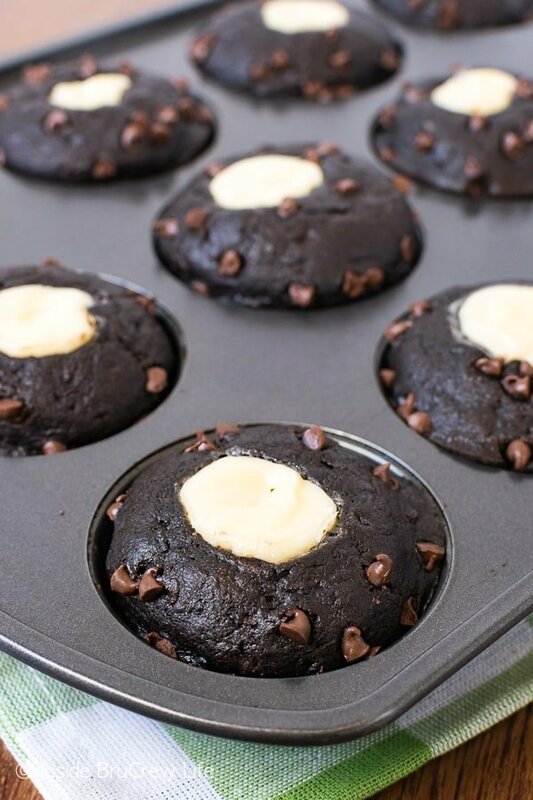 Spoon the batter evenly into 18 greased muffin pan cavities. Mix together your cheesecake filling and spoon half of it into a ziplock baggie. Cut one tip off and sink it into the center of each muffin. Squeeze the cheesecake into each muffin center. Refill your baggie with the rest of the cheesecake and add a swirl of cheesecake to the top of each muffin. 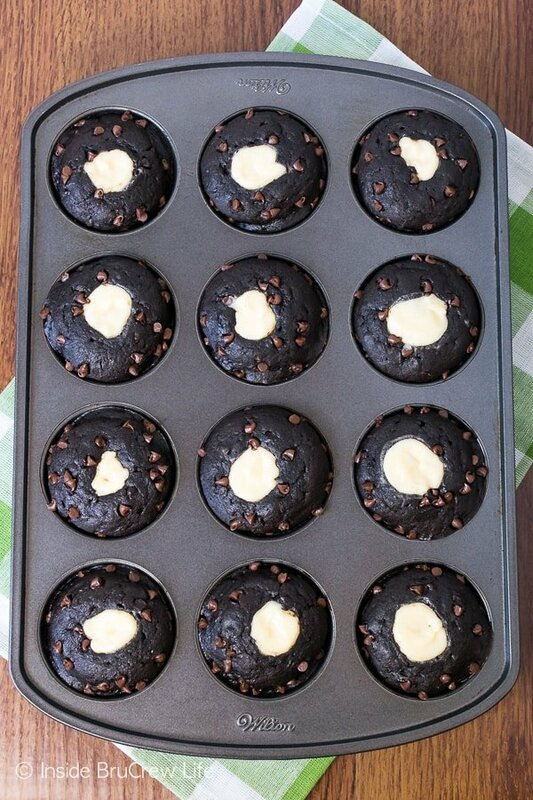 Sprinkle the edges of the muffins with the rest of the mini chocolate chips before baking them. 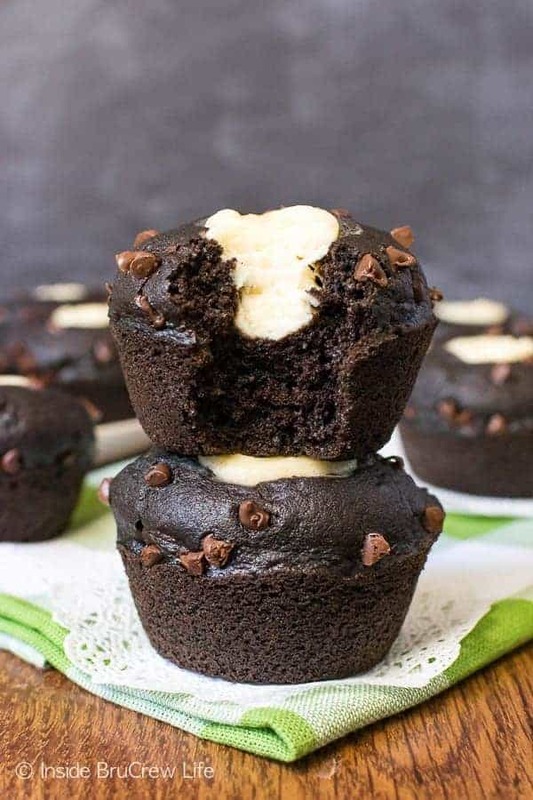 This just makes these Chocolate Zucchini Cheesecake Muffins look like bakery style muffins. Gotta love pretty muffins, right? 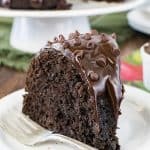 Plus, extra chocolate is always a win. Preheat the oven to 400 degrees. Spray 18 muffin tin cavities with non stick spray. 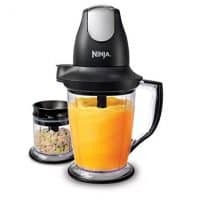 Beat the oil, sugars, vanilla, and eggs. Stir together the dry ingredients. Slowly add this mixture alternately with the buttermilk to the wet ingredients. Mix until everything is incorporated. Stir in 1/2 cup mini chocolate chips and shredded zucchini gently. Spoon the batter evenly in the prepared muffin tins. Mix together the cheesecake filling in a bowl. Spoon half the mixture into a ziplock baggie and cut one tip off. Insert the tip into the center of the muffin batter and squeeze gently. Fill each muffin this way until the cheesecake filling is gone. Refill the bag with the remaining filling and go back and add a swirl of cheesecake filling to the top of each muffin. 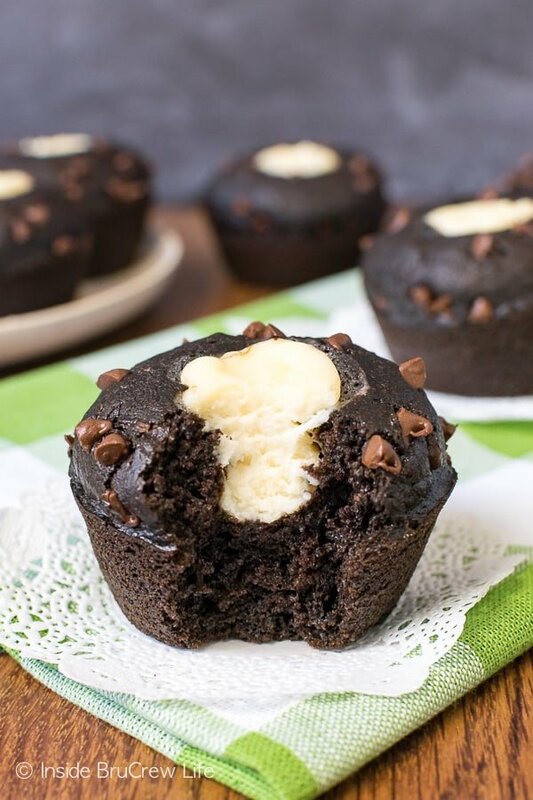 Sprinkle the sides of the muffin batter with the reserved chocolate chips. Bake for 14-15 minutes. Remove and let the muffins cool in the pan for 2-3 minutes. 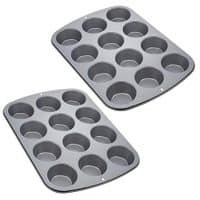 Gently remove the muffins and place the muffins on a wire rack to cool completely. Store in a tightly sealed container.